Hey guys! 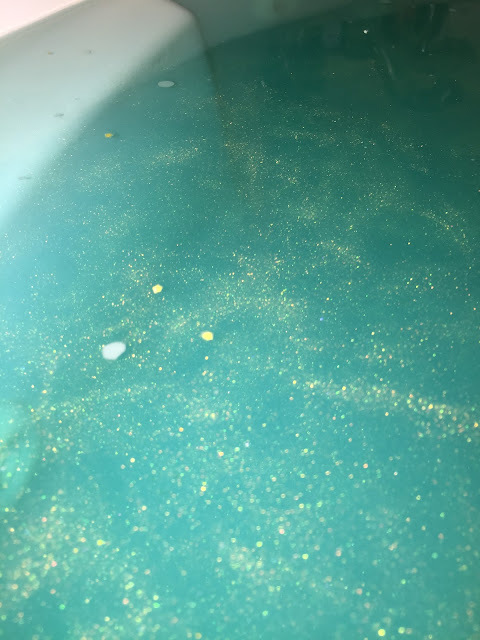 Today I have the Golden Wonder bath bomb from Lush. I got this one based off my in-person smell test at my local store before I made my online order. It has your typical combo of orange oil and lime oil with cognac oil. 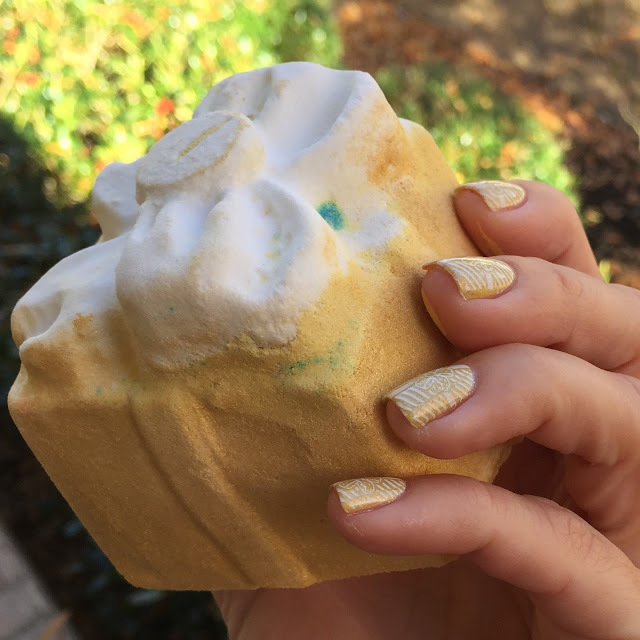 I think it's designed to smell like a cocktail but to me it comes across as a very typical Lush item smell..very clean and fresh. 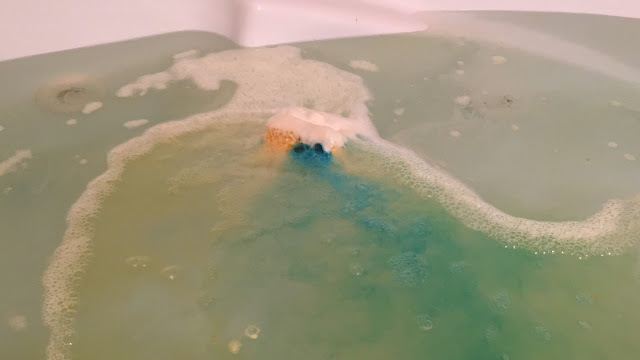 This bath bomb is HUGE!! 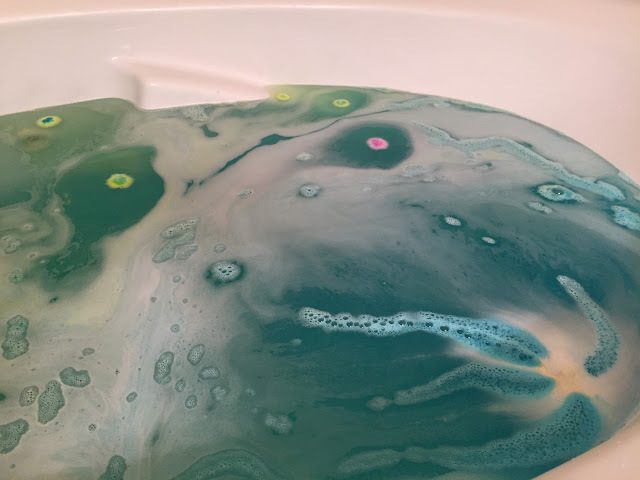 I don't know if it really translates in the picture but it's way bigger than the regular round bath bombs. It's also covered in lustre....which y'all know is not really my bag. I had a hard time figuring a way to hold if for the pictures and I kept getting it all over myself. 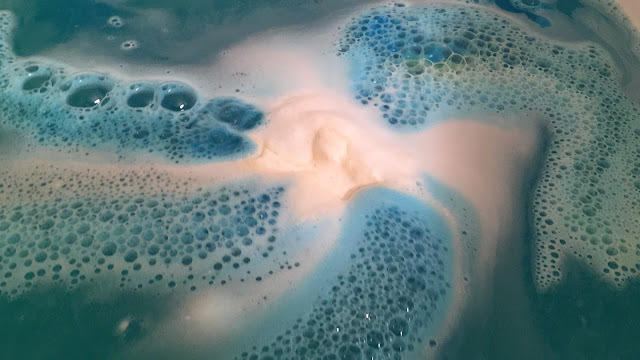 It made me kind of dread the bath, even though it's so pretty and smells so good! 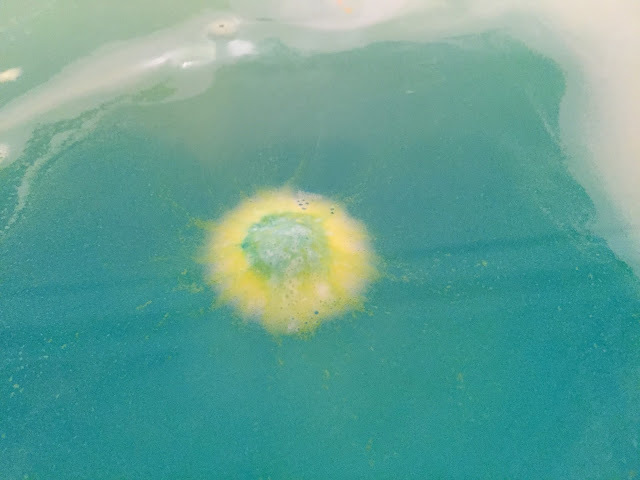 When you put it in the water it starts fizzing immediately and turns the water yellow. Luckily, surprisingly bright turquoise bubbles come out quickly and start transforming the water. Golden Wonder was really impressive to watch. I took a ton of pictures! At the end there's little bits of brightly colored bits that look like confetti. LOOK at that turquoise water! I fell in love! 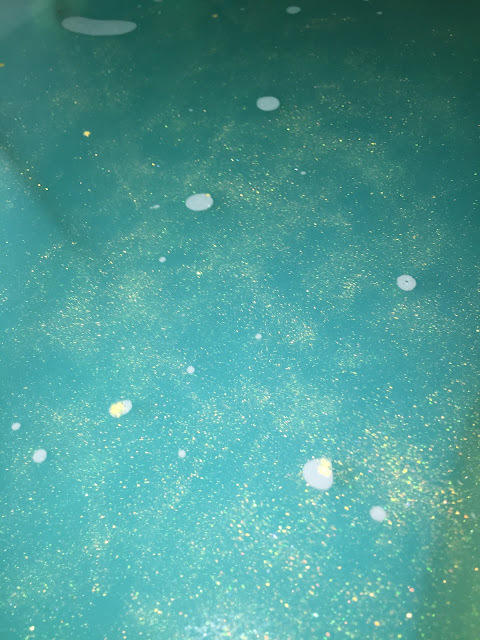 The water didn't look too terribly sparkly until I decided to shine the light from my phone into the water. It looked like a galaxy of sparkle that was suspended in the water all the way down, not just floating on top. These pictures I took with the flash. You can also see the tiny little paper stars floating on the top. They dissolve in the water eventually but really contribute to the galaxy look and feel! I was quite covered in lustre when I got out, which I was expecting. This bath bomb is really beautiful and I would definitely recommend! I'm just a sucker for that turquoise colored water. 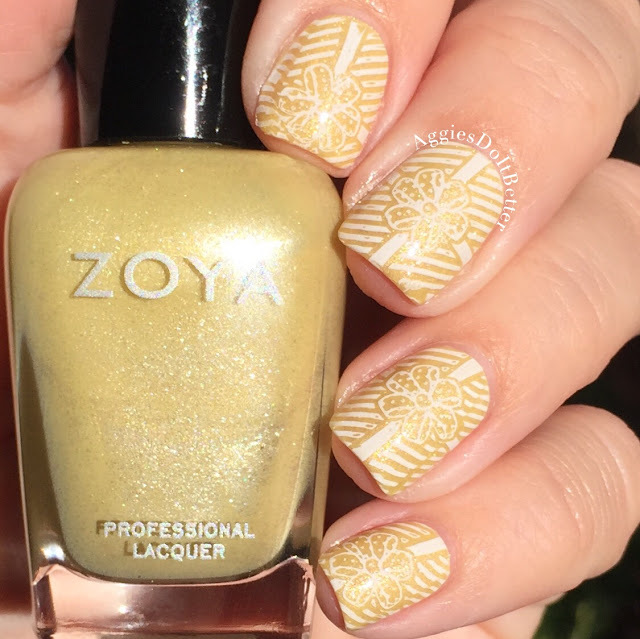 I searched through my collection and found the perfect shimmery pale yellow, Zoya Piaf. It took 3 coats but it's worth it :) I used Zoya Purity for the white stamping and Moyou Festive Collection 06 plate which I'm slowly getting more comfortable with. I still had a little wrinkling of the design like I mentioned before. My nails are super curvy also so maybe that's it? I don't wear Piaf that often, it's an oldie I found in a clearance rack years ago. It really is beautiful though! Omg I love Lush bath bombs! 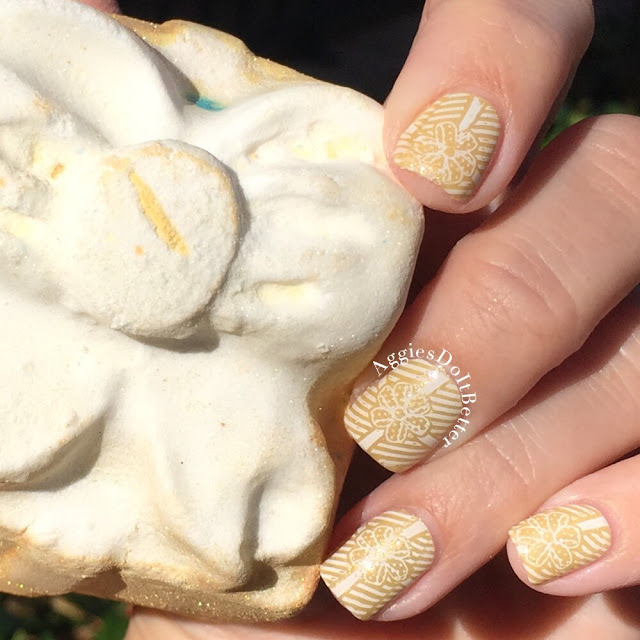 And your bath-bomb inspired nail looks are so cute, especially the one with the tiny little owl. I'm trying to learn nail art as well, will keep stopping by here for more inspiration!